So far, BumbleSpots has partnered with Moxy Hotels, Marriott International’s new brand aimed at a younger, hipper crowd. There are verified BumbleSpots within the Moxy Hotel at two locations in New York (Times Square and the Financial District), and one each in Chicago, Denver, New Orleans, Seattle, Tempe, and Minneapolis. Bumble will be expanding to other cities as well as to different venues, including bars, coffee shops, and restaurants in the U.S. and Canada, according to Bustle. 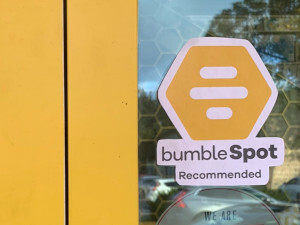 All BumbleSpots locations will have a Bumble decal so users can easily identify they’re in the right place. In addition to providing a safe place to meet, Bumble and partners like Moxy Hotels will be offering special deals on food, drink and other perks for Bumble app users. Moxy is offering two-for-one cocktail specials, complimentary access to their workspaces, and games to break the ice with your date. BumbleSpots aren’t meant just for dates, but also for career networking and making new friends through the company’s other platforms Bumble Biz and Bumble BFF. The company also plans to offer ice breakers via napkins and coasters to get the conversation going no matter what the occasion. This is a lawsuit waiting to happen. Someone will say they were injured in some way, whether physically, emotionally, or mentally and sue Bumble. They should stop wasting marketing and money on useless ventures and try listening to their customer base. Google play shows 70% or more of the complaints related to their foolish time restrictions of 24 hours (and +24 hour boost) as counter-productive as most people are on dating sites because they dont have time to meet a mate normally. Women typically dont go on the site every couple of hours and so a 3 day weekend is an immediate death sentence to a match. Fix that first..listen to your customers before you lose them.